[The exemplary life of the little Jacques Duclos]. The line under the photograph reads in French: “Plus vite! Maman, plus vite!” – [“Faster, Mummy, faster!”]. Full-color poster, signed J. Sennep, printed by Paix et Liberté [s.d. ]; 30 x 40 cm. 1This caricature emphasizes the subordination of the French Communist Party with regard to Communist dictates. In September 1947, the French Communist Party was obliged to take up the cudgel of the Cold War against its former allies in government in the wake of the Szklarska Poręba Conference, in Polish Silesia, which saw the creation of the Cominform, a successor the defunct Third International that had been founded in 1919 and dissolved in 1943. The secretary general of the Party, Maurice Thorez, reluctant to be ordered about, had delegated Jacques Duclos to attend the meeting. Not coincidentally, the French Communist Party was the target of numerous accusations there. It was reproached with having entered into a pact with reactionary forces. The French Communist Party was urged to break with the (previously Stalinist) tactic of the Popular Front. The task from now on was to struggle against American imperialism incarnated in the Marshall Plan as well as against its valets, especially the Socialist SFIO, a social democratic party that had formerly been the Communists’ ally. 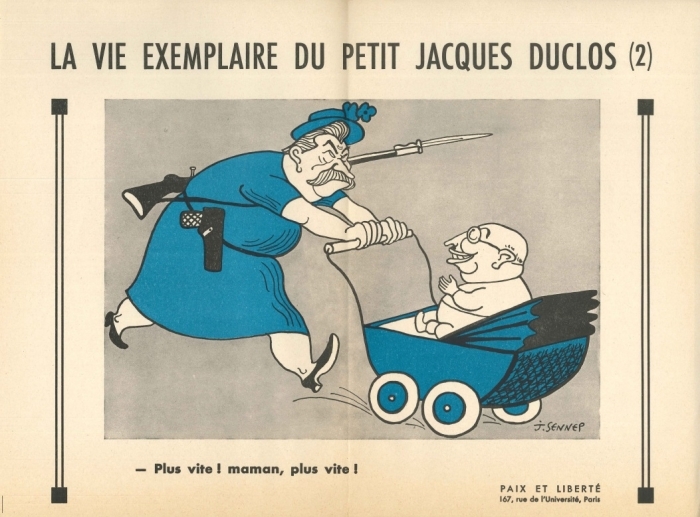 2Humiliated by these critiques, the suave Jacques Duclos had no choice upon his return to Paris but to offer a French version of the militant Zhdanov report read out at Szklarska Poręba. On 29 November 1947, he greeted the Prime Minister, Robert Schuman, in the National Assembly with the cry “Voilà le Boche!” using a derogatory French term for German. He went on to denounce the Socialists for “being under the command of the potentates of the dollar” and, for good measure, called the Gaullists “neofascists.” That day Duclos outdid himself. Ranting against the government he cried out, “lying dogs, bastards, liars, this is the way that Hitler acted, this is a Boche law.” Assassins, liars, cowards, fascists, executioners were among the most mild epithets in the Communist repertory. Later, Maurice Thorez would say to François Mitterand, then Minister of Veterans’ Affairs and later first socialist President of the Fifth French Republic: “Provocateurs, you are talking like Goering [a leading Nazi and commander of the Luftwaffe].” This parliamentary session lasted four days and four nights. The Communist deputies had the numbers, the endurance, and the enthusiasm to stay at the tribune as long as they wished preventing minsters and rapporteurs from speaking. The government withstood this assault and the image of Jacques Duclos, previously considered debonnair and urbane, changed completely. Sylvain Schirmann, Robert Schuman et les Pères de l’Europe, Brussels: Peter Lang, 2008, (quotation p. 272). KOTEK, Joël. La vie exemplaire du petit Jacques Duclos In: From Communism to Anti-Communism: Photographs from the Boris Souvarine Collection at the Graduate Institute, Geneva [en línea]. Geneva: Graduate Institute Publications, 2016 (generado el 18 avril 2019). Disponible en Internet: <http://books.openedition.org/iheid/6650>. ISBN: 9782940503971. DOI: 10.4000/books.iheid.6650. Kotek, Joël. “La vie exemplaire du petit Jacques Duclos ”. Liebich, Andre, y Svetlana Yakimovich. 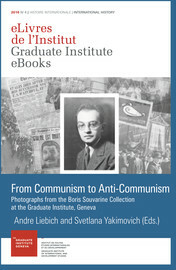 From Communism to Anti-Communism: Photographs from the Boris Souvarine Collection at the Graduate Institute, Geneva. Geneva: Graduate Institute Publications, 2016. Web. <http://books.openedition.org/iheid/6650>. LIEBICH, Andre (dir.) ; YAKIMOVICH, Svetlana (dir.). From Communism to Anti-Communism: Photographs from the Boris Souvarine Collection at the Graduate Institute, Geneva. Nueva edición [en línea]. Geneva: Graduate Institute Publications, 2016 (generado el 18 avril 2019). Disponible en Internet: <http://books.openedition.org/iheid/6440>. ISBN: 9782940503971. DOI: 10.4000/books.iheid.6440. Liebich, Andre, y Svetlana Yakimovich, ed. From Communism to Anti-Communism: Photographs from the Boris Souvarine Collection at the Graduate Institute, Geneva. Geneva: Graduate Institute Publications, 2016. Web. <http://books.openedition.org/iheid/6440>.